Call 972-913-6063 to schedule your first appointment. Make Miracle-Ear® your choice for hearing aids in Plano, TX. We've been in business for more than 70 years, and we've worked hard to build up our reputation as the country's best known and most respected providers of hearing aids and accessories. Want to Hear Even Better Than Normal? Amazingly enough, our hearing aids with GENIUS™ Technology may help you hear better when listening to conversations in noisy environments. They can do this through the use of features like Directional Focus and VoiceTarget 360; with them, you'll be able to zero in on exactly the conversations you want to hear. If you like, you can use the GENIUScontrol app* on your smartphone to discreetly adjust volume, hearing programs, and bass and treble levels. Whether you live in Plano, Dallas, Garland, or Richardson, you can quickly discover and experience the Miracle-Ear advantage at our hearing aid center. Give us a call today. When you purchase one of our hearing aids, we'll make a lifetime commitment to the ongoing care of your hearing aids. You can take your hearing aid to any one of our more than 1,300 locations nationwide for a free checkup. We'll clean your hearing aids, install a new battery, make adjustments, and much more. The Plano, TX Miracle-Ear is a proud provider and sponsor of the Miracle-Ear Foundation. With every hearing aid sold, we help provide the Gift of Sound to low-income, qualified candidates who have exhausted all resources to provide for their hearing health. See how we help those living in our communities! Doug Stennett is your local Licensed Hearing Aid Professional in Plano, Texas. Doug has been in practice since August of 1995. Doug is Board Certified in Hearing Instrument Sciences and has been licensed as a Hearing Instrument Fitter and Dispenser by the Texas Department of Licensing and Regulation. He is a past member of the Board of Directors for the Texas Hearing Aid Association. He currently assists as proctor for the State Exam for Fitters and Dispensers. In addition, Doug has been through extensive training with Miracle-Ear and has received his Miracle-Ear Professional Certification. Doug has also been trained in Live Speech Mapping, Real Ear Measurement, deep canal impressions, and is proficient with all Audiometric equipment to service your needs. 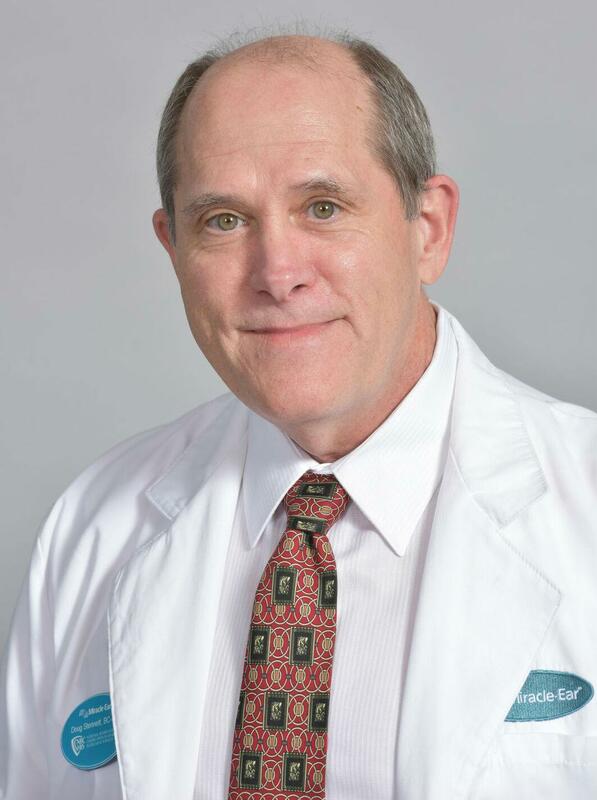 Doug is dedicated to providing his patients with excellent care. His dedication was recognized by being awarded the Professional of the Year Award. Doug is a native Texan from Lubbock. He received his RN degree and attended Texas Tech University. Doug is married to Ellen, his wife of 30+ years and also enjoys his first grandchild, Matthew. His hobbies include fishing and collecting classic cars. In addition, Kathy Versoy is the Office Manager for Miracle-Ear in Plano and has been here since 1998. Kathy is fully trained and completely certified by Miracle-Ear as a Professional Assistant and has been recognized for outstanding customer service. She has lived in the Dallas area since 1975 and is a proud grandmother. Working as a team, Doug and Kathy are here to service all of your hearing needs at Miracle-Ear in Plano. Since wearing Miracle-Ear hearing aids it has allowed me to reconnect with my family and friends. The service that I received was exceptional. I loved the employees and will certainly want to return for my check ups – and reconnect to others. Now, I can not only hear TV, music and conversation but I can hear other sounds that I was missing out on. Miracle-Ear works. What advice would you share with someone considering purchasing hearing aids for the first time? Don’t give up, let Miracle-Ear work with you because it’s an art to make the hearing aids work for you, at least it was for me. How has the Miracle-Ear product(s)/service(s) made a difference in your life? They make a big difference for me. Enjoy church more now! This is my 3rd set of hearing aids from three difference companies, but Miracle-Ear are the first and only ones I have been happy with. I am very impressed with Miracle-Ear’s after care. They are very concerned that your new hearing aids conform to your lifestyle and work with you to make your hearing the best it can be. I feel my hearing is 100% better than my prior hearing aids. Robert G. Mills that has worked with me from the Miracle-Ear office in Waco, TX has been very patient and understanding of my hearing problem. I am very glad I tried Miracle-Ear as I had about given up on finding a solution to my problem. Thanks again Miracle-Ear.